By Melissa Leave a Comment - The content of this website often contains affiliate links and I may be compensated if you buy through those links (at no cost to you!). Learn more about how we make money. Last edited March 8, 2019 . While visiting his son and daughter-in-law, Brian had a stroke. He was in the hospital for several days and then in a rehab facility. His memory was foggy, in part because he was also experiencing the symptoms seen with the onset of dementia. As is traditional for couples from his era, Brian handled all of the household bills and other documents. Neither his wife nor his son and daughter-in-law knew how to get into his accounts to determine what bills were due when. 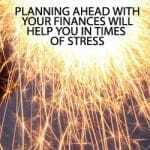 The family was already stressed about Brian’s health issues; worrying about finances just added stress. Are you the one who mostly handles household bills and tasks? If you were unavailable for a few days due to a travel delay or hospitalization, would your family be able to take over for you? If you’re like most households, the answer is no. In my family, I pay all of the bills, know what medicines our kids take when, and know who our vet is. My husband would likely not know any of this were I unavailable or the worst case happened and I passed away. 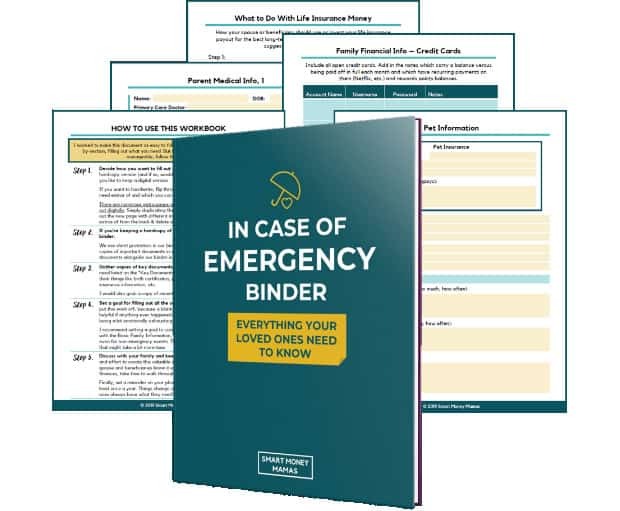 One way you can help your family find the information they need in an emergency is through the new In Case of Emergency Binder created by Smart Money Mamas. You can either fill out the information in the binder electronically or printed as a hard copy. The author herself keeps a hard copy as well as an electronic copy in her safe and an electronic copy with her mother. If you print a hard copy, you can keep original documents such as birth certificates, marriage licenses, life insurance policies, etc., right in with this book. The binder contains 170 pages, but if the number of pages intimidates you, please note that about 80 pages are simply extra copies of the forms throughout the book that you can use if needed. The author recommends setting a goal of filling a section out every few days. She also recommends updating the binder at least once a year or when a life event happens like selling a house, having a baby, changing jobs, etc. 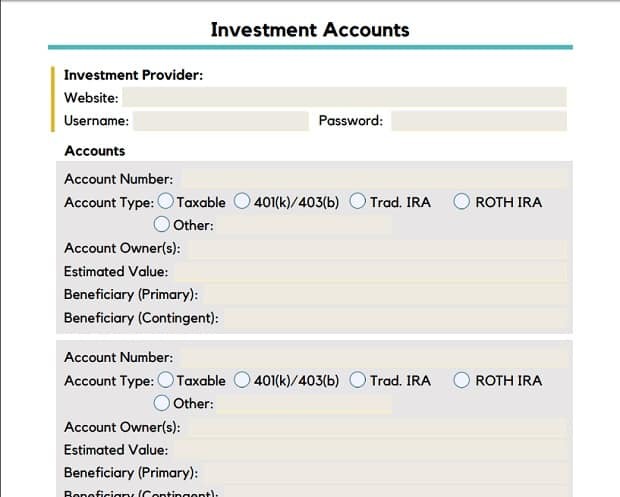 There are two major sections in this binder for you to look at, fill out and complete. For instance, you can write down your child’s routine, likes and dislikes as well as family traditions, so if someone does have to step in and take over for you, the caregiver will have a better idea of routines familiar to the child to make the transition easier. This binder is so much more than a place to store important details needed in an emergency! I’ve been trying for the past year to write down important information my family might need if anything happened to me, and I can see now that I left out a lot! For instance, this binder has a place for you to put your child’s IEP, if she has special needs. Some of my children have IEPs, and I would have never thought to have included that with the information my family needs, though it is vital. But there’s also a place for things like favorite family recipes and family traditions. If your children have to be placed with another family, this information is usually most cherished and often lost when the caregiver dies. In addition, there’s a space for you to share with your children your favorite memories of them as well as details about your life that you can share such as your favorite movie, song, and food as well as stories about your own life. 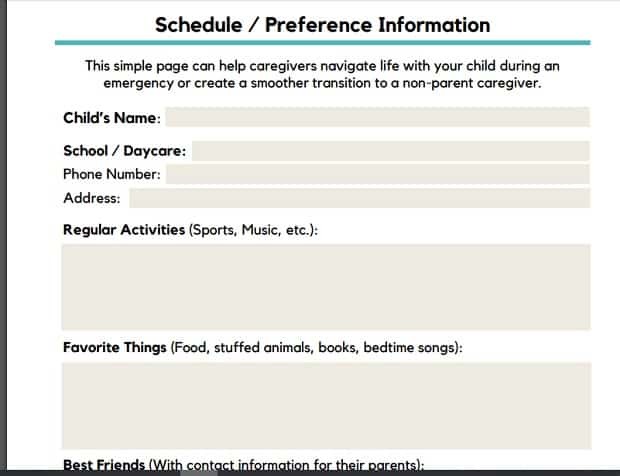 Having this information will help your children retain a connection to you, even when you’re gone. 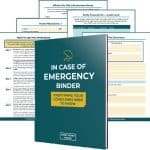 One great thing about the In Case Of Emergency Binder is that it has a 100% money back guarantee. So if you purchase it and don't think it's for you (I don't think you will), you can get your money back. 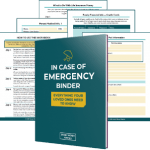 Download the In Case of Emergency Binder, print it out, and if you don't love it, then just email me and I'll give you all your money back. No fine print, no funny games. I'm taking a risk by doing this. I can't make you give the emergency binder back. I can't reach through cyberspace to delete the PDF off your hard drive, so you could just order the workbook, ask for a refund, and rip me off. But I'm going to trust that you're not going to do that. Because I believe as soon as you see what's inside, you're going to understand its value. You're going to see important things you never thought to write down and that will be worth far more than the $29 price tag. I'm confident that you'll see the value in the binder as well. This binder is $29, which I’m sure your family members would pay several times over if it meant that they could easily take over in case anything happens to you. We aren’t always given the chance to prepare our loved ones for our passing, especially in the case of accidental death. 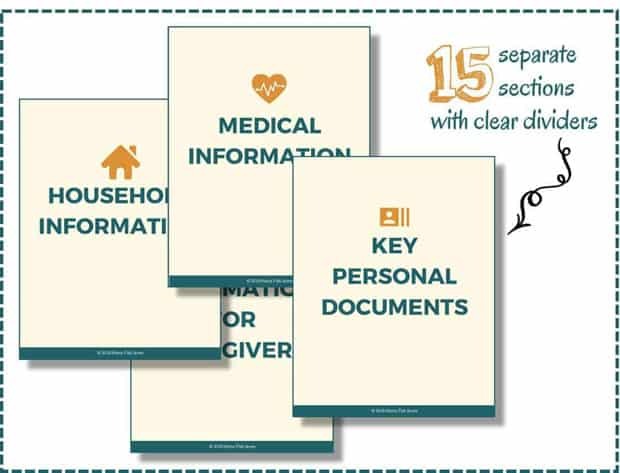 However, this binder is a way to prepare in advance, so no matter when or how we pass, our family will have the information they need. I’m the one who will be responsible for my mom’s estate if anything happens to her, and getting the information in this binder would be priceless. The document is well-organized, and all of the information is easily accessible. If you fill this out in its entirety, your family will have everything they need to make sure they can go on without you. Are you prepared if anything happens to you? Would your family be able to take over, or would they be scrambling to find passwords, accounts, etc.? 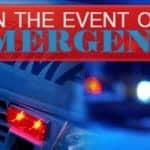 The large emergency fund or contingency fund is an important part of a good financial plan. 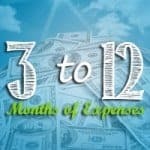 Here's why you should save 3-12 months of expenses. Previous Post: 150+ Birthday Freebies: Where To Get Free Stuff On Your Birthday This Year!